The double-barreled firing of general manager Tim Murray and head coach Dan Bylsma has produced its first casualty: Swedish prospect Rasmus Asplund has decided to remain overseas and will not be signing an entry-level contract with the Buffalo Sabres this offseason. It’s very turbulent in Buffalo right now, considering that they will have new coaches in both NHL and AHL. . . It would be fun to go a long way in a playoff and accumulate experience from it. Then I want to take my step in my development and get better, take small steps throughout the season and maybe get some game in Tre Kronor. It’s like the next step and thus the next goal. 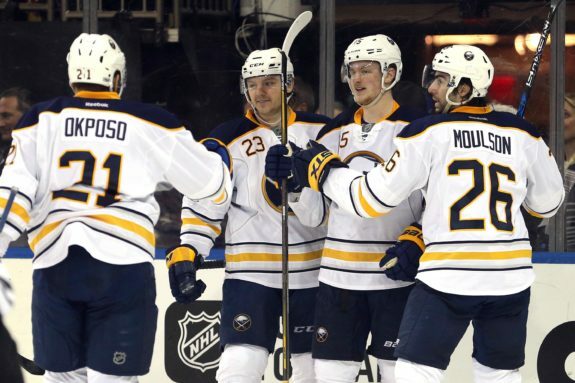 Let’s break down how this affects the Buffalo Sabres next season, and for the foreseeable future. The Buffalo Sabres acquired Asplund in the 2016 NHL Entry Draft, drafting him with the 33rd overall pick. Depending on who you speak with, the trade that sent Mark Pysyk to Florida in exchange for Dmitry Kulikov might have been more about Asplund than anything else, as the trade allowed the Sabres to move up to 33 from 39 in the draft, thereby giving them a greater chance at landing the Swedish player. Whether that is true or not, this much is certain – the Sabres liked what they saw in Asplund, and were thrilled to get him. Helping Asplund’s cause was the fact that he had played alongside another prized Sabres prospect, Alexander Nylander. Asplund and Nylander both impressed playing for Sweden in the 2017 IIHF World Juniors Championship this winter, with Asplund picking up six assists and finishing the tournament plus-5, solidifying his claim as a complete two-way player. He continued to impress, picking up six goals and 19 points in 39 games with Farjestads BK Karlstad – and keep in mind, he is still only 19 years old. It’s always fun to be on the same team as Alex. He’s an outstanding player and a good guy in the room, too. And now we’re both Sabres . . . I was there [Buffalo] for two months this summer and it’s an amazing hockey town. Everyone is crazy about hockey so it’s going to be exciting to get there soon. It is easy to see why Sabres fans might be disappointed by Asplund’s decision to remain in the SHL for one more season, then – but there is zero reason for disappointment to turn to concern. Without a doubt, the team that will be affected by Asplund’s decision the most is the Rochester Americans, Buffalo’s American Hockey League affiliate. If any team was going to benefit from Asplund deciding to sign an entry-level contract, it was the Amerks. With neither Nylander nor Asplund considered anywhere ready to make the jump to the NHL, fans who wished to see the two reunite were going to have to watch the Amerks play. Given the fact that Nylander and Asplund are considered Buffalo’s best two offensive prospects, their presence would have been quite the boon to the Amerks. Sadly, Asplund’s decision takes some of the luster off the Amerks’ upcoming season, in more ways than one. I think one of the successes from the organization I’m coming from is their relationship between Wilkes-Barre and Pittsburgh. And we want to re-strengthen the relationship with Rochester and Buffalo because for us, developing an organization that’s going to be year-in, year-out successful in the NHL, you have to have that development and you have to have that in place. Bringing a new head coach might put the Amerks on track to start winning again, but losing Asplund for at least another season is a short-term blow that will possibly doom the Amerks to a fourth-straight season in which they miss the playoffs. As much as you might feel for Rochester Americans fans, the only thing that really matters when it comes to Asplund is his development. In this regard, Sabres fans have nothing to worry about. Whether you agree with Asplund’s representatives who deem the AHL inferior to the SHL, you cannot argue against the fact that a prospect needs to feel comfortable in order to fully develop. The firing of Murray and Bylsma sent shock waves through the entire Sabres organization. With both the Sabres and the Amerks looking for head coaches, and with certain players acquired on Murray’s watch such as Evander Kane being discussed as trade bait, you can argue that this is not the best atmosphere for an overseas player to be exposed to in his first year in the states. If Asplund feels the atmosphere is turbulent, it makes complete sense for him to remain in a system in which he feels comfortable. Sure, it might ultimately result in his joining the Sabres one year later than many in the organization had projected, but what’s more important – rushing him into the NHL or making sure he develops his game to the point where it translates into the NHL? Obviously, it is the latter. Asplund has the potential to become a solid third or even second line center for the Sabres team down the road, which is why his decision is just a temporary setback to the Buffalo Sabres and their fans.